Works have been completed on Queensberry Street to increase capacity for traffic during closures required for Metro Tunnel construction. To facilitate the construction of Parkville Station, Grattan Street (between Royal Parade and Leicester Street) will be closed from late 2017 for up to five years. In preparation for this temporary but extended closure, the changes to Queensberry Street allow traffic to flow more efficiently through the north of the city. Queensberry Street was widened to two traffic lanes between Elizabeth and Rathdowne streets giving road users heading east-west across the city an additional option to Grattan and Victoria streets. The bike lane on both sides of Queensberry Street has been retained, maintaining safe passage for cyclists. The works saw 112 car parking spaces removed, primarily from the median strip between Rathdowne and Leicester streets. Most parallel parking was retained to ensure safe access to shops and residences. The existing 891 parking spaces in adjacent streets - within 100 metres walk of Queensberry Street - were also retained. All loading zones, resident permit and disabled parking have been retained. Two car share spaces were relocated. 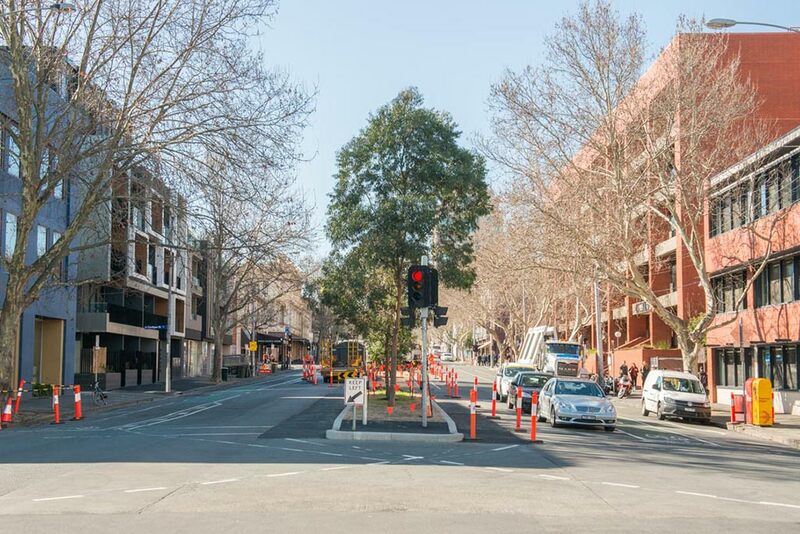 A total of four trees were removed, two on the corner of Rathdowne and Queensberry streets and two on the corner of Lygon and Queensberry streets. Works along Queensberry Street (between Lygon and Rathdowne streets) were undertaken within a Heritage Overlay (H01 and H0992). However due to the type of works proposed, no planning permit was triggered.